Airbus is no stranger to unusual designs. In 2014, the budget travel giant registered a patent for a flying saucer, with circular seating arrangements that expanded outward from the center of the plane. 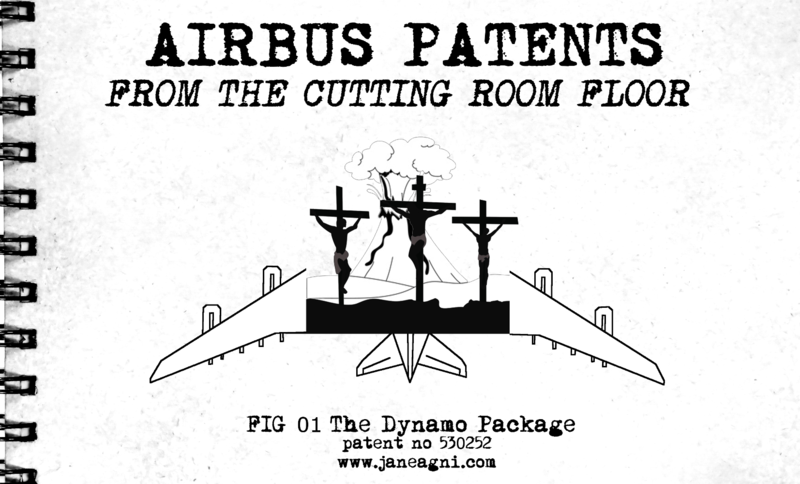 But for every loony design that becomes an Airbus intellectual property, there’s hundreds of stark raving insane concepts that never make it past the drawing board. Every year, hundreds of potential new patents aren’t up to snuff, and they’re scrapped until the next round of brain storming and market research begins. National Report has it on good authority that the following images are official unused Airbus designs left on the cutting room floor. These schematics were relinquished to me by a shrewd, entrepreneurial-minded Airbus janitor who rescued them from their fateful meeting with a paper shredder. The Sky Chariot can hold up to 500 passengers, who are then laid side to side on comfortable hammocks for the entire length of the massive plane. It’s believed that flying across country on The Sky Chariot would only cost customers $20.00 American, had it made the cut. In the instance that you find yourself feeling anti-social, consider The Iron Maiden, which is a medievil torture device fitted with a plane engine and wings. Several blades are strategically welded into the single passenger seating area which then punctures major organs upon closing of the pod doors. Or if you’re of the religious persuasion, the Cruci-Flier is a flight custom made for your sensibilities. You and two other lucky passengers are nailed to wooden crosses before being rocketed to your final destination. Going to a tropical hot-spot? Why not get your sultry dream vacation started early with Airbus original: The Erupting Volcano. You will be directly in the midst of a destructive volcano, viciously erupting for the entire duration of your trip. Can’t get much more exciting than that! The Guantanamo Bay Detention Center modified for air travel. If comfort isn’t a big concern, this plane is sure to cushion your wallet–just not your hind-end! Flight attendants patrol the aircraft with vicious attack dogs and take mocking photographs of your naked body smeared in feces. With The Guantanamo Bay model you can experience water boarding, extended solitary confinement and even sensory deprivation miles above the ground! Because Airbus wanted make full use of the clip-art they had purchased, I present to you The Dynamo Package. The Dynamo Package was designed so that you could experience both the agony of Crucifixion, while also enduring torrents of ash and scalding lava. Truly there is no finer way to travel. We presented the Airbus drafts to several people awaiting flights at the Portland International Airport, asking if they would consider traveling under these various conditions. The reviews were decidedly split. Tim Mercer, an Oregon native, rarely flies, but when he does it’s cross country to see his grandparents in Daytona Beach Florida. Annoyed with the abundance of fellow passengers, Mercer noted that the Iron Maiden looked particularly comfortable, and that he would definitely consider the benefits of flying solo if given the option.